A pseudo-Messiah who lived about 1160; born at Amadia in Kurdistan. He became thoroughly proficient in Biblical and Talmudic knowledge, studying under Ḥisdai, the Prince of the Exile, and under Ali, the head of the Academy in Bagdad. He was versed in the literature of the Moslems and known as a worker of magic. The condition of the califate in the days of Alroy afforded a ready opportunity for a venturesome character to stir up political tumult. The crusades had caused a general condition of unrest and a weakening of the authority of the sultans of Asia Minor and Persia. On all sides there arose spirited chieftains who set up small independent states in defiance of their paramount ruler. 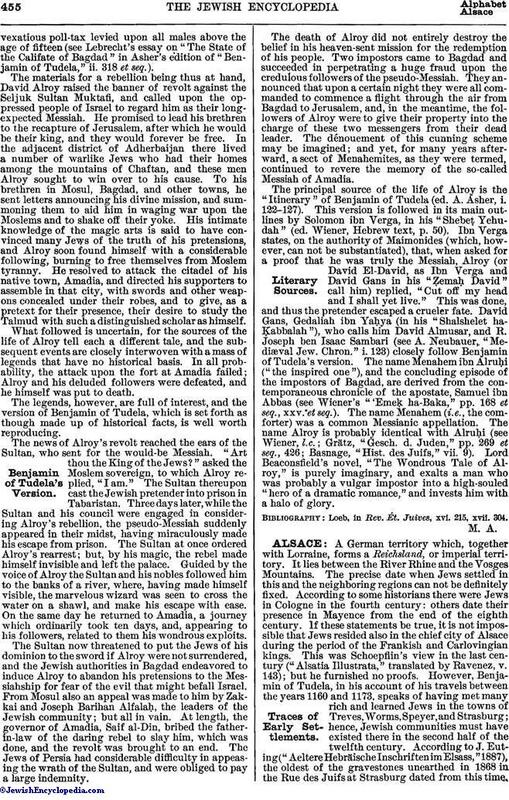 This state of affairs was in itself a source of disturbance among the Jews of the califate, and was aggravated by the existence of avexatious poll-tax levied upon all males above the age of fifteen (see Lebrecht's essay on "The State of the Califate of Bagdad" in Asher's edition of "Benjamin of Tudela," ii. 318 et seq.). The materials for a rebellion being thus at hand, David Alroy raised the banner of revolt against the Seljuk Sultan Muktafi, and called upon the oppressed people of Israel to regard him as their long-expected Messiah. He promised to lead his brethren to the recapture of Jerusalem, after which he would be their king, and they would forever be free. In the adjacent district of Adherbaijan there lived a number of warlike Jews who had their homes among the mountains of Chaftan, and these men Alroy sought to win over to his cause. To his brethren in Mosul, Bagdad, and other towns, he sent letters announcing his divine mission, and summoning them to aid him in waging war upon the Moslems and to shake off their yoke. His intimate knowledge of the magic arts is said to have convinced many Jews of the truth of his pretensions, and Alroy soon found himself with a considerable following, burning to free themselves from Moslem tyranny. He resolved to attack the citadel of his native town, Amadia, and directed his supporters to assemble in that city, with swords and other weapons concealed under their robes, and to give, as a pretext for their presence, their desire to study the Talmud with such a distinguished scholar as himself. What followed is uncertain, for the sources of the life of Alroy tell each a different tale, and the subsequent events are closely interwoven with a mass of legends that have no historical basis. In all probability, the attack upon the fort at Amadia failed; Alroy and his deluded followers were defeated, and he himself was put to death. The legends, however, are full of interest, and the version of Benjamin of Tudela, which is set forth as though made up of historical facts, is well worth reproducing. The news of Alroy's revolt reached the ears of the Sultan, who sent for the would-be Messiah. "Art thou the King of the Jews?" asked the Moslem sovereign, to which Alroy replied, "I am." The Sultan thereupon cast the Jewish pretender into prison in Tabaristan. Three days later, while the Sultan and his council were engaged in considering Alroy's rebellion, the pseudo-Messiah suddenly appeared in their midst, having miraculously made his escape from prison. The Sultan at once ordered Alroy's rearrest; but, by his magic, the rebel made himself invisible and left the palace. Guided by the voice of Alroy the Sultan and his nobles followed him to the banks of a river, where, having made himself visible, the marvelous wizard was seen to cross the water on a shawl, and make his escape with ease. On the same day he returned to Amadia, a journey which ordinarily took ten days, and, appearing to his followers, related to them his wondrous exploits. The Sultan now threatened to put the Jews of his dominion to the sword if Alroy were not surrendered, and the Jewish authorities in Bagdad endeavored to induce Alroy to abandon his pretensions to the Messiahship for fear of the evil that might befall Israel. From Mosul also an appeal was made to him by Zakkai and Joseph Barihan AlfalaḦ, the leaders of the Jewish community; but all in vain. At length, the governor of Amadia, Saif al-Din, bribed the father-in-law of the daring rebel to slay him, which was done, and the revolt was brought to an end. The Jews of Persia had considerable difficulty in appeasing the wrath of the Sultan, and were obliged to pay a large indemnity. The death of Alroy did not entirely destroy the belief in his heaven-sent mission for the redemption of his people. Two impostors came to Bagdad and succeeded in perpetrating a huge fraud upon the credulous followers of the pseudo-Messiah. They announced that upon a certain night they were all commanded to commence a flight through the air from Bagdad to Jerusalem, and, in the meantime, the followers of Alroy were to give their property into the charge of these two messengers from their dead leader. The dénouement of this cunning scheme may be imagined; and yet, for many years afterward, a sect of Menahemites, as they were termed, continued to revere the memory of the so-called Messiah of Amadia. The principal source of the life of Alroy is the "Itinerary" of Benjamin of Tudela (ed. A. Asher, i. 122-127). This version is followed in its main outlines by Solomon ibn Verga, in his "Shebeṭ Yehudah" (ed. Wiener, Hebrew text, p. 50). Ibn Verga states, on the authority of Maimonides (which, however, can not be substantiated), that, when asked for a proof that he was truly the Messiah, Alroy (or David El-David, as Ibn Verga and David Gans in his "ẒemaḦ David" call him) replied, "Cut off my head and I shall yet live." This was done, and thus the pretender escaped a crueler fate. David Gans, Gedaliah ibn YaḦya (in his "Shalshelet ha-Ḳabbalah"), who calls him David Almusar, and R. Joseph ben Isaac Sambari (see A. Neubauer, "Mediæval Jew. Chron." i. 123) closely follow Benjamin of Tudela's version. 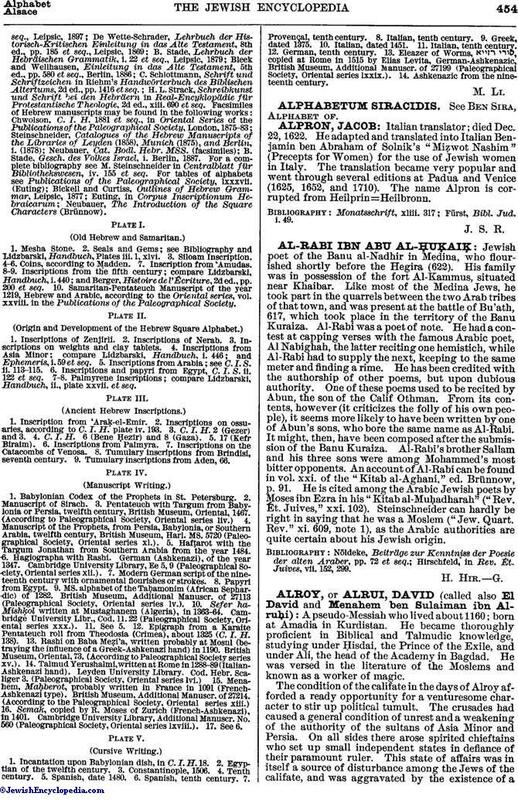 The name Menahem ibn AlruḦi ("the inspired one"), and the concluding episode of the impostors of Bagdad, are derived from the contemporaneous chronicle of the apostate, Samuel ibn Abbas (see Wiener's "'Emeḳ ha-Baka," pp. 168 et seq., xxv. et seq.). The name Menahem (i.e., the comforter) was a common Messianic appellation. The name Alroy is probably identical with AlruḦi (see Wiener, l.c. ; Grätz, "Gesch. d. Juden," pp. 269 et seq., 426; Basnage, "Hist. des Juifs," vii. 9). Lord Beaconsfield's novel, "The Wondrous Tale of Alroy," is purely imaginary, and exalts a man who was probably a vulgar impostor into a high-souled "hero of a dramatic romance," and invests him with a halo of glory. Loeb, in Rev. Ét. Juives, xvi. 215, xvii. 304.